Combination chemotherapy refers simply to the use of more than one chemotherapy medication at a time to treat cancer. In the past, cancer was often treated with a single drug, but current treatments for many types of cancer use a combination of two or more different drugs simultaneously. Since chemotherapy drugs affect cancer cells at different points in the cell cycle, using a combination of drugs increases the chance that all of the cancer cells will be eliminated. At the same time, however, using more than one drug has the disadvantage of increasing the risk of drug interactions, and if there is a problem, it may be hard to know which drug was at fault. Recently, chemotherapy has also been used with a type of immunotherapy known as checkpoint inhibition, and may increase the chance that the immunotherapy drugs will be effective. What should you know before you begin combination chemotherapy? The use of combination chemotherapy to treat cancer was inspired in the 1960s when scientists wondered whether the approach to treating tuberculosis—using a combination of antibiotics to reduce the risk of resistance—would work for the treatment of cancer as well. Using this approach, cancers that had previously been almost universally fatal such as acute lymphocytic leukemia and Hodgkin’s lymphoma became largely curable. Since that time, combination chemotherapy has been adopted for the treatment of many other cancers as well. In the 1970's, combination chemotherapy was found to be more effective than single drugs for people with lung cancer, and more effective than "sequential chemotherapy" or using chemotherapy drugs one at a time in sequence, rather than at the same time. It's only in the last decade that chemotherapy has been added to a new type of immunotherapy called checkpoint inhibition. In some situations, adding chemotherapy drugs appears to make the immunotherapy drugs more effective. 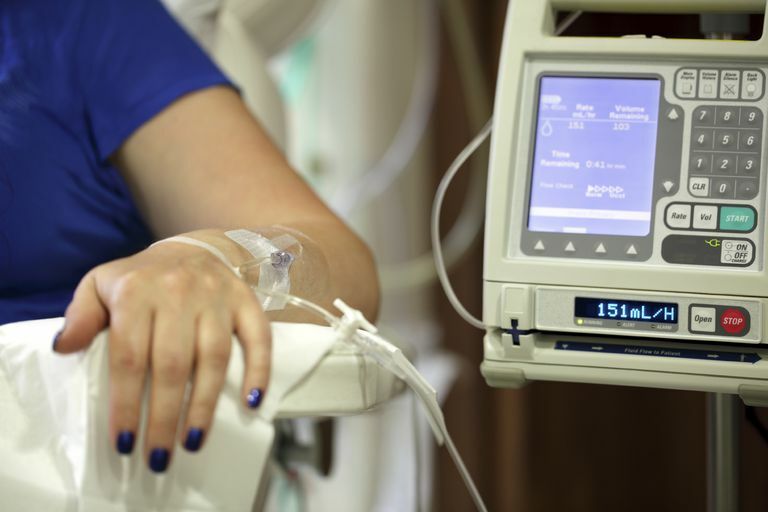 At the current time, combination chemotherapy may be more appropriate in some situations and with some cancers, while single-drug chemotherapy may better in others. There are many combinations of chemotherapy drugs that are used for different types of cancer. Combination chemotherapy is used with several types of solid tumors. An example with lung cancer is using the combination of Platinol (cisplatin) and Navelbine (vinorelbine) to treat non-small cell lung cancer. For women who have early stage lung cancer, combining two drugs (often Adriamycin and Cytoxan), followed later by Taxol appears to reduce the risk of recurrence. With some leukemias and Hodgkin lymphoma, several chemotherapy drugs may be used together, and combination chemotherapy has greatly increased survival rates from many of these diseases. Sometimes an acronym is used to describe combination chemotherapy. One example is ABVD for Hodgkin's disease which stands for the combination of the chemotherapy medications Adriamycin (doxorubicin), Blenoxane (bleomycin), Oncovin (vinblastine) and DTIC-Dome (dacarbazine). When chemotherapy is used along with immunotherapy, benefits may go beyond using the combination of drugs. Immunotherapy drugs work simplistically by helping the immune system recognize and attack cancer cells. When cancer cells are broken down by chemotherapy drugs, it can help the immune system recognize these cells as abnormal so that the immunotherapy drugs can be more effective. This phenomena, known as the abscopal effect, is also sometimes seen when radiation therapy is combined with the type of immunotherapy known as checkpoint inhibitors. Decreasing the chance that a tumor will be resistant to the treatment. Just as a combination of antibiotics may be used in case a particular bacteria is resistant to one of the medications, using two or more chemotherapy drugs reduces the risk that a tumor will be resistant to the treatment. It is usually the development of resistance that results in chemotherapy becoming ineffective over time. Making it possible to give all medications as early as possible in the disease. Being able to address several targets in the cancer process at the same time. Cancer is a complex disease involving many steps. The use of chemotherapy medications that work on different molecular targets, or points in the cancer process should, in theory, raise the chances of eliminating the cancer. Tumor "heterogeneity." Scientists use the term tumor heterogeneity to describe how the cancer cells in tumors vary from each other. While the initial cells in a cancer are "clones"—in other words identical—successive divisions result in changes in the cells. Some of the resulting cells in a tumor may respond to a particular drug while others may be more responsive to another drug. Lower dosage. Recently research is also looking at ways in which using a combination of chemotherapy medications can be used to allow oncologists to use some of the drugs at lower doses, and hence reduce the likelihood of toxic effects. In other words, instead of using a high dose of one drug, it may be possible to use lower doses of two or more drugs. In practice, the use of combination chemotherapy with many cancers has either been found to improve survival, or result in a better response to treatment. This is especially true when chemotherapy is used as an adjuvant treatment, that is, treatment designed to get rid of any remaining cells that are left after surgery or other therapies (such as the chemotherapy often given after surgery for early stage breast cancer). With metastatic cancer, the goal of treatment is often different. For example, with metastatic breast cancer, since it is no longer curable, the goal is to use the least amount of treatment possible to control the disease. In this case, a single chemotherapy drug may be preferable and allow for a better quality of life. Difficulty knowing which drug caused a particular side effect. If a person develops a side effect when several medications are used, it may be difficult to know which of the medications is responsible. In this case, all of the medications may need to be discontinued if the side effect is serious. Drug interactions. Sometimes side effects occur not due to a particular medication, but due to reactions between the medications. The more medications a person is using (both chemotherapy drugs and other medications), the greater the chance that an interaction will occur. Accumulation of side effects. For example, if you use two drugs which cause a low white blood cells count, the risk of chemotherapy-induced neutropenia (a reduced number of the type of white blood cells known as neutrophils) is increased. Become familiar with common chemotherapy side effects as well as long-term side effects of chemotherapy, but keep in mind that methods of controlling these symptoms have improved dramatically in recent years. For example, many people no longer experience nausea and vomiting even on the drugs most likely to cause these symptoms. To make you days during chemo go just a little bit smoother, check out the essentials list of what to pack for chemotherapy. Combination chemotherapy can sometimes work to extend life, reduce the risk of cancer recurrence, or improve the results from immunotherapy. That said, adding more medications can increase the side effects and rigor of treatment. While many people dread chemotherapy, it's important to note that very significant advances have occurred in managing these effects. For example, anti-nausea drugs can now greatly reduce or even eliminate nausea due to the drugs most likely to cause it. Likewise, injections such as Neulasta or Neupogen (drugs that increase the white blood cell count) are allowing doctors to use higher (and more effective) doses of chemotherapy drugs than was previously possible. DeVita, V. and E. Chua. A History of Cancer Chemotherapy. Cancer Research. 2008. 68:8643. Hu, M., Huang, P., Wang, Y., Su, Y., Zhou, L., Zhu, X., and D. Yan. Synergistic Combination Chemotherapy of Camptothecin and Floxuridine through Self-Assembly of Amphiphilic Drug-Drug Conjugate. Bioconjugate Chemistry. 2015. 26(12):2497-506.